The section below the weathervane sculpture piece is called the ‘Harness’. In most cases, it is comprised of the the vertical spire, large and small copper globes, solid brass cast directionals (North, South, East, West arms), brass ring(s) and chrome pivot balls (not visible). 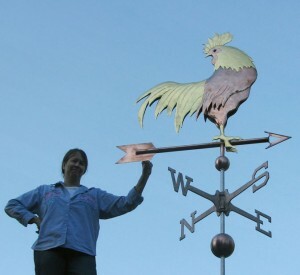 The harness is included in the price of the weathervane, unless you opt for a custom design. The Harness section also varies in size depending on the size weathervane sculpture piece you select. 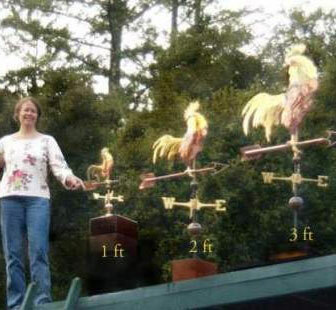 Above left, is a photo showing LizAnne (5′ 8″) (~172cm) standing next to three of our Chanticleer Rooster Weathervanes in our Small, Medium and Large standard sizes. The photo to the right is of an Extra-Large Chanticleer Rooster weathervane. 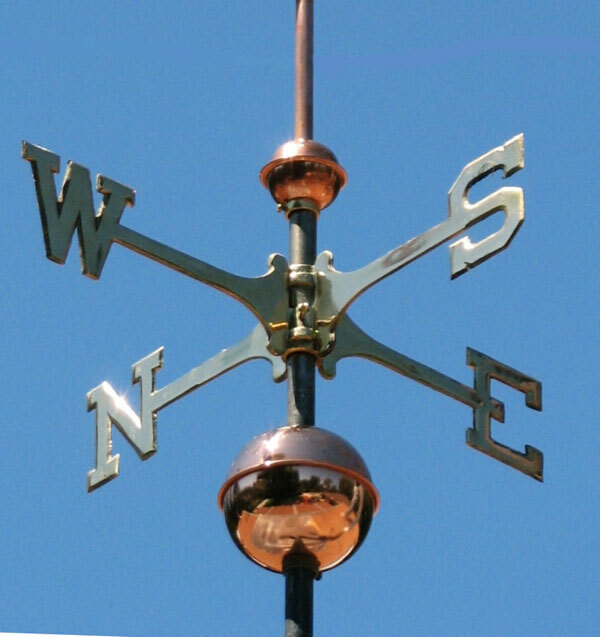 Here are some other factors to consider when determining which size weathervane will work best for you.